Leashless umbilical, simmilar to the "Grivel Double Spring"
These umbilicals are good for keeping those leashless tools from taking the big plunge. Mostly applicable for alpine climbs and longer ice routes where dropping your tool will mean more than just lowering off and starting again. This one is made of "military" or hikers tape webbing. I believe it is rated to 1000lb static load (or roughly 4.5kN). Knotts decrease the strength of slings, so I would not reccomend using this as an anchoring device. 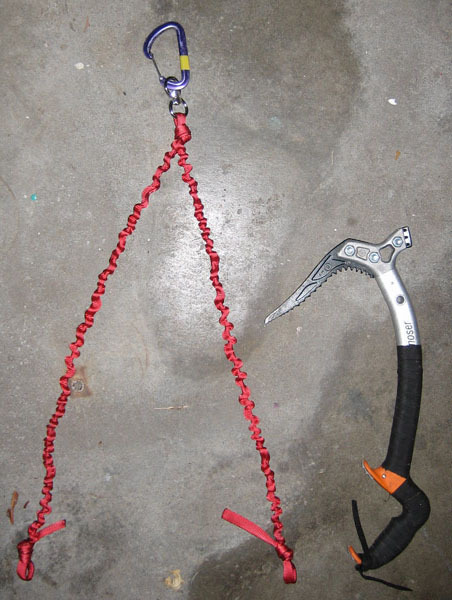 If you want an anchoring device, use full strength climbing webbing. The military webbing is great for the umbilicals because it doesn't resist bunching as much when the shock cord is compressed (see picture above). Both shock cord and military webbing can be found in the rental department of REI. For length, determine what your waist-to-tool distance is going to be. Don't stretch yourself to the max for this measurement, just raise your arm with a tool in it and get a cute girl to measure it. ok, on to the next step... before this goes downhill. Buy equal lengths of webbing and shock cord. Open the ends of the webbing up and feed the shock cord through. This takes some patience. Just pat yourself on the back, smiling all the while about how you're making something better and cheaper than the commercial version. The overhand knot and swivel. You'll connect this to your harness. 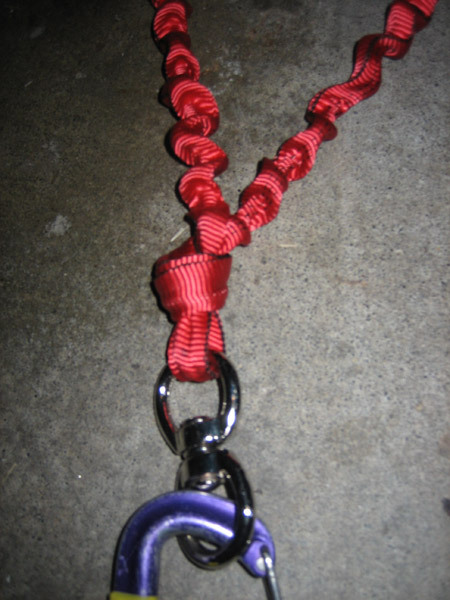 Now clip the swivel to your harness and have that cute girl come back and measure out the distance to the tool. Mark it on the webbing with a pen. This will be the top of the next overhand knot. 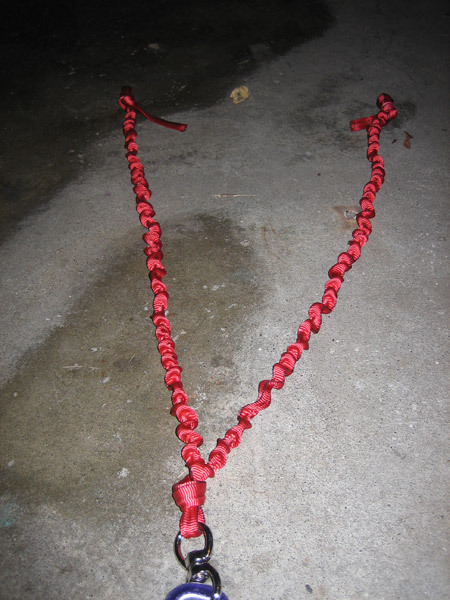 Pull the shock cord through one of the umbilicals, about 6" to 12" worth and tie an overhand knot at the desired length. 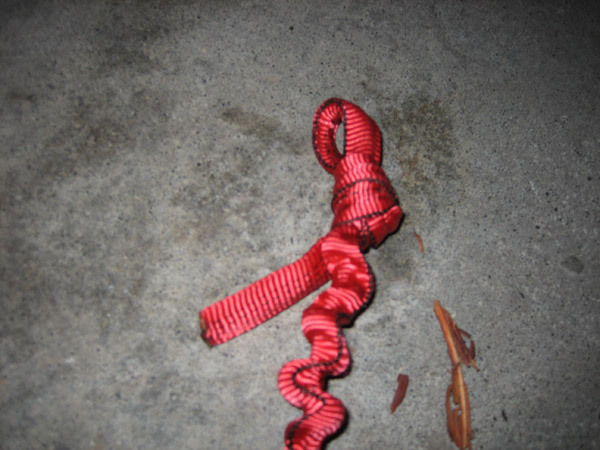 Note that the sock cord is actually running inside the webbing of the knot. Pull the shock cord through and tie the webbing. Do the other side, and connect them to your tools. Your natural swing of the tool should not be impeaded by any spring from the shock cord. If so, lengthen each leg. At your absolute top stretching drop kneeing backstepping extremo reach, it is okay for the shock cord to stretch a bit. Just trim off the extra shock cord and you're done! If you don't get the lengths just right, don't worry about it. You can always attach it to your harness with a short sling.